David Hertz is the principal of The Studio of Environmental Architecture in Venice. He has spent his career developing sustainable design concepts, such as the widely publicized 747 Wing House in Malibu, made of a defunct airplane. He put together a team called The Skysource/Skywater Alliance and they entered the Water Abundance Xprize competition, launched in October 2016. XPRIZE is a nonprofit that runs public competitions to encourage technological development that could benefit humanity. Their challenge to entrants was to figure out a way to produce 2,000 liters per day in a 24 hour period using 100 percent renewable energy at at a cost of less than 2 cents per liter. 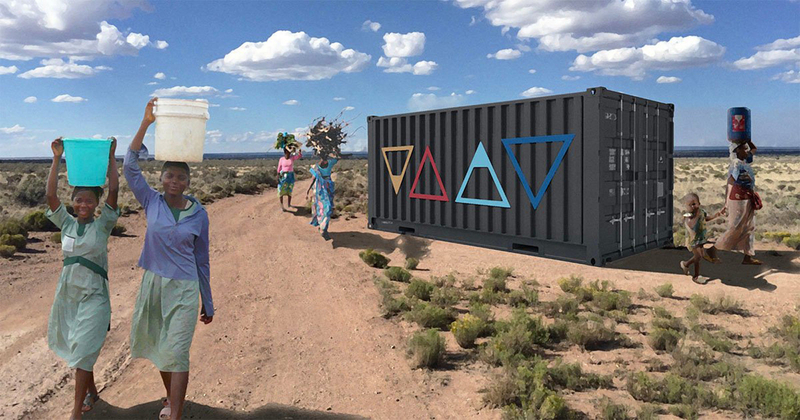 The goal was to offer a viable model for access to clean water for the 790 million people — 11 percent of the world's population — who currently live without it. Ninety-eight teams from 27 different countries submitted entries. Hertz says their team did not originally make the cut at the start of the two-year competition. They were invited to compete late in the process, after another team dropped out, and then won with their system called WEDEW (Wood to Energy Deployed Water). WEDEW combines existing technologies. First, there’s a patented technology called Skywater for creating condensation (in which Hertz is an investor). And that’s combined with biomassification, or burning biomass (that is, everything from wood chips to other organic materials, such as walnut shells, rice hulls and coconut husks). The heat is used to turn moist air into condensation, which is then collected in a tank. And it’s housed in a repurposed shipping container that is solar-powered. The technology simulates the temperature at which dew formation is possible, creates water, and then filters it using very little energy. The XPRIZE organizers would not accept anything hypothetical, incomplete, or dysfunctional. The Skywater/Skysource Alliance worked with All Power Labs in Berkeley to test the concept and and in the week of final testing, finalists had to run their device for 24 hours straight. That’s when the LA team pulled away from the other remaining competitor, another US team named JMCC Wing, after their product experienced a glitch. Hertz says he anticipates this technology being applied to a wide range of communities -- villages in Africa where women currently walk several hours a day to access water; places hit by disaster where centralized water has become polluted; or even community gardens in South LA that could use a direct source of water. A less advanced version of the product is actually already on the market and Hertz says they will use the $1.5 million to in his words, “productize” the The Skysource/Skywater Alliance concept.